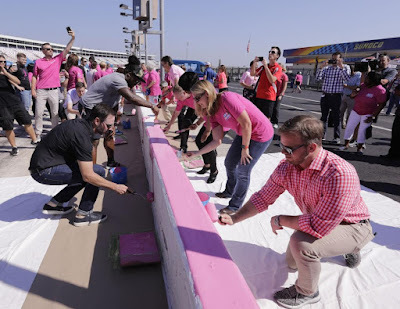 Joined by hundreds of breast cancer survivors, seven-time NASCAR Cup Series champion Jimmie Johnson, fellow drivers Chris Buescher and Kaz Grala and legendary Carolina Panthers running back DeAngelo Williams painted Charlotte Motor Speedway's pit wall pink on September 20th. 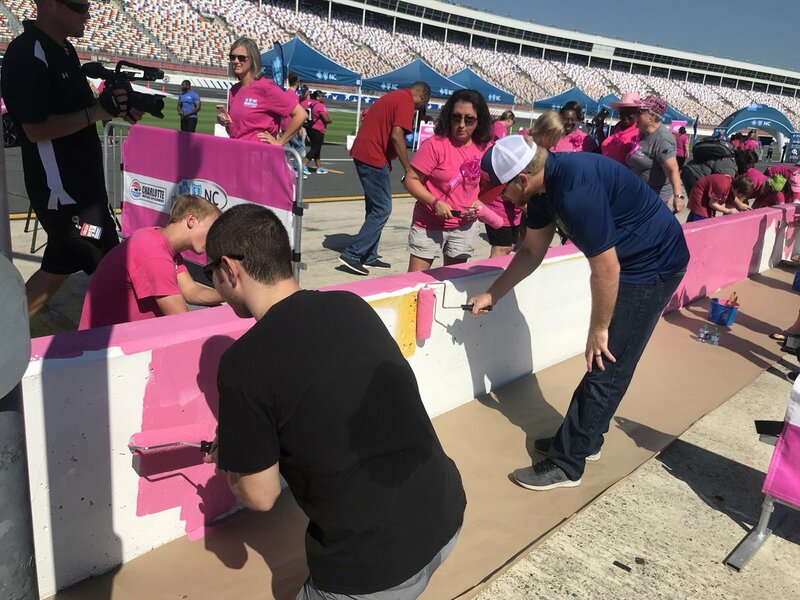 The fifth Paint Pit Wall Pink event featured a collection of Blue Cross and Blue Shield of North Carolina employees helping an all-star cast of dignitaries and breast cancer survivors in adorning the speedway's wall with a bright shade of pink to salute breast cancer awareness. Speedway Motorsports CEO Marcus Smith and Charlotte Motor Speedway Executive Vice President Greg Walter joined Johnson, Williams, Buescher, Grala in picking up paint rollers and turning the 1,500-foot white pit wall into a pink pit wall. NASCAR on FOX personality Hermie Sadler - whose mother is a breast cancer survivor - emceed the event. Johnson, a longtime Blue Cross and Blue Shield Live Fearless ambassador, said the pit wall pink event hits home to his family as well as to people throughout the world. "It's great to be a part of such a bigger picture and raising awareness for a great cause," Johnson said. 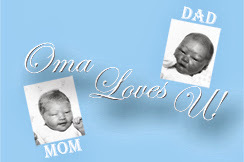 "Blue Cross and Blue Shield of North Carolina has had me involved with many different projects, but this one hits deep. To meet survivors and hear their stories really hits me. It's impossible for someone to go through life without knowing someone or a family who has dealt with breast cancer. I've had many friends deal with it and then most recently, one of my wife's childhood friends was diagnosed and she's started treatment. "It's part of our lives. I'm a father of two daughters and I know that what I learn and experience here helps me have the right lens on how I need to go home and make sure my children understand the important of early screening. It's amazing to see the cause and to see our industry support it." Williams lost his mother and four aunts to breast cancer. 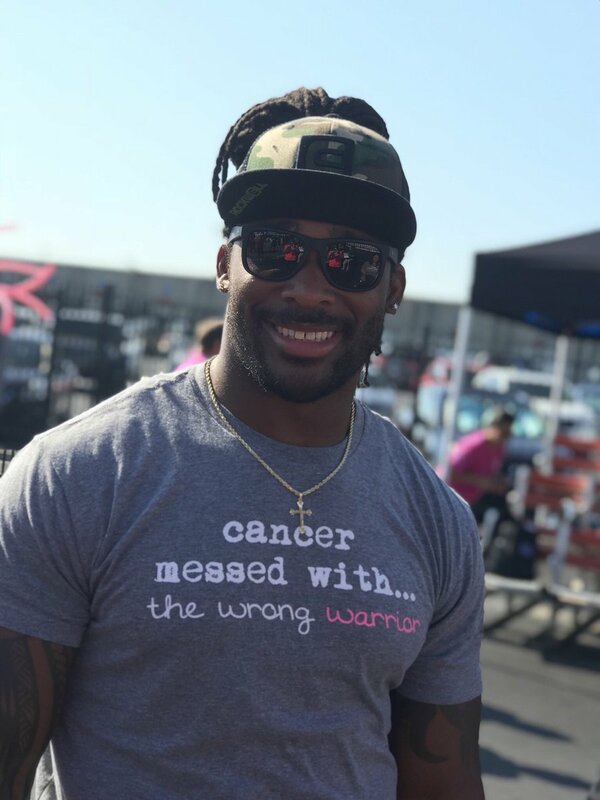 The Pro Bowl running back founded the DeAngelo Williams Foundation in 2006 to support the eradication of breast cancer through research and preventative care. "This is huge," Williams said. 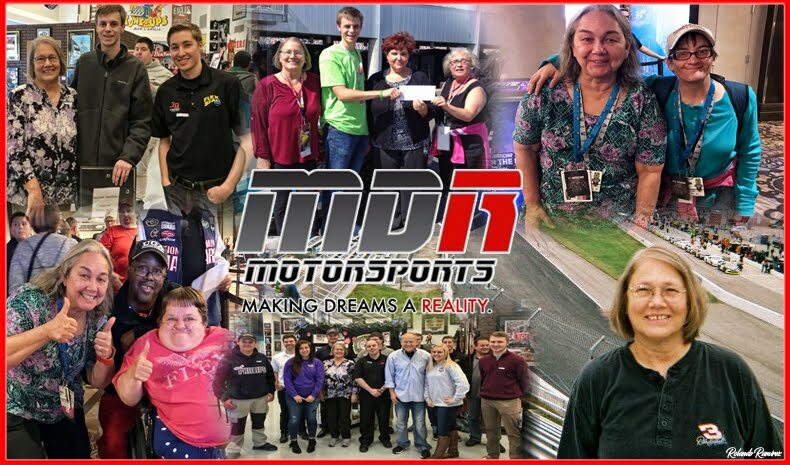 "For them to show the support they have … people around the world who are watching the (races at the Charlotte Motor Speedway ROVAL™) will see the pink and ask questions like, 'What's the pink mean?' The number of calls and (direct messages) I've received - just in the NFL alone - I know that this will reach as many people as the NFL reaches. Saving lives is what we're all about. This is bigger than any game or sport that we play." Attendees listened to a powerful speech from Anita Brown-Graham, a breast cancer survivor, Blue Cross and Blue Shield of North Carolina trustee as well as the director of ncIMPACT and a professor of Public Law and Government at the University of North Carolina at Chapel Hill. "I've had people come up to me and say 'I'm a 20-year survivor,' 'I'm a 10-year survivor,' 'I'm a five-year survivor,'" Brown-Graham said. "I'm a one-month survivor. That's a gift to me, to be able to look that far into the future. 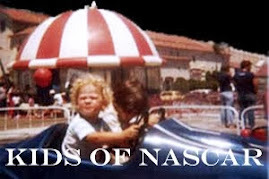 Everybody is coming to Charlotte Motor Speedway with this sense that NASCAR is behind us. You can just feel it, it's electrifying here today." Johnson presented Brown-Graham with a commemorative pair of pink gloves like the ones the four-time Bank of America fall race winner will wear throughout October. The speedway also unveiled a pink Toyota Camry pace car for the Drive for the Cure 200 presented by Blue Cross Blue Shield of North Carolina on Sept. 29 on the Charlotte Motor Speedway ROVAL™. Anita Brown-Graham speaking on her experience of battling cancer.